In this video, we are going to simplify rational expressions. It’s just like reducing fractions. Begin by simplifying the constants. Let’s now look at the exponents. The numerator is to the fourth power while the denominator is to the fifth power. As a result, there will be one x in the denominator but not in the numerator. Now let’s look at an example where there is an operation taking place in the numerator. 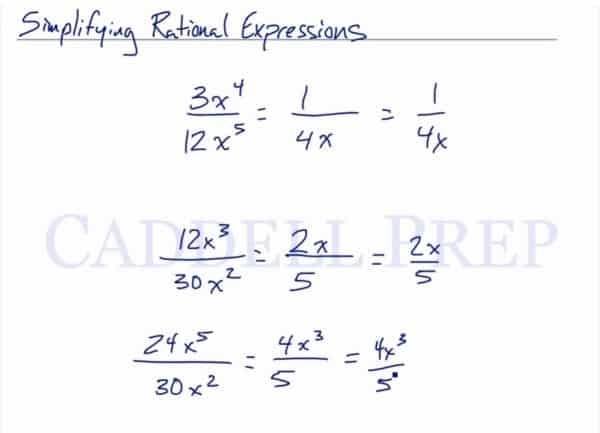 Let’s go over how to simplify rational expressions. We want to reduce this. What we have to do is reduce it just like reducing normal fractions. Reduce the constant by finding the greatest common factor. Which is . Then, to divide the . The -term stays at the denominator because is greater than . When dividing the , let’s subtract from . Here, think of a number that goes into both of these. does. Then divide and . Then subtract the exponents of . The difference on the exponent stays at the numerator because it’s higher. Now, let’s look at these two examples. This one has a binomial in the numerator and a monomial in the denominator. If we have two terms separated by a plus or a minus sign, we can actually split them up. It looks like the first example but it’s flipped. This has a monomial numerator and a binomial denominator. In the first example, we can split the binomial into two because it’s in the numerator. So, we keep it as it is. And then reduce it from here. Now, let’s get the greatest common factor which goes into all of these terms. What number goes into , , and ? Then let’s get the lowest exponent for . The two examples look similar but we end up with different answers. This is another type of rational expression. Since the numerator is separated by minus, we can split them up. This is how to try to do it. We can’t get very far in reducing this. There is only one greatest common factor for each. In this case, this is not the best method. What we want to do is just to factor from the beginning. Now that we have two factors, we can cancel this out.